Ruled Out by Planck’s Satellite Data? By Dr. Julio A. Gonzalo. Since 1998, when the unexpectedly accelerated expansion of the universe was first reported, it has become customary to describe the universe using the LCDM model. The implicit critical assumption of a non-zero cosmological constant and a null space curvature is shown here to be open to question. The availability of exact analytical solutions for Einstein cosmological equation in the L-Cold Dark Matter and the K-Open Friedman-Lemaitre models makes it easy to quantitatively compare different models of the universe regarding the existence and proportion of dark matter and energy, the CMB anisotropies, the maximum observed redshifts, the average cosmic density and other cosmic quantities. The fact that both models, as well as intermediate ones, fit many of the experimental data reasonably well, while they are still prone to criticism in different places, can be taken as proof that further investigation is needed. Here is the time derivative of the radius of the observable universe R, is the finite mass of the universe, including the observable universe and that part of the plasma universe beyond the sphere of the CMB which is not directly observable (with its average density), G = 6.67 ´ 10-11 IS units is Newton’s gravitational constant, k the space-time curvature, c = 3 ´ 108 m/s the speed of light, and L (m-2) the cosmological constant. We assume that equation (1) describes correctly the cosmic evolution at least as a first approximation. General compact solutions of equation (1) are used below to investigate what values of k and L are compatible with the available observational evidence, especially with reasonable values of Hubble’s parameter (Livio & Riess 2013) and with the age of the universe, t0. It is well known that in the early 1950’s there were two competing models, based upon very different interpretations of equation (1), to describe the apparently isotropically expanding universe: the Big-Bang model (first proposed by G. Lemaitre and later developed by G. Gamow, R.A. Alpher and R. Herman), and the Steady State model (developed by T. Gold, H. Bondi and F. Hoyle). The second model postulated a continuous creation of matter out of nothing to keep (artificially) constant the cosmic density during the expansion. The discovery of the 3 K cosmic background radiation by A. Penzias and R. Wilson in 1966 made the Steady State model untenable, but its assumption of spontaneous creation of matter or energy through volume increase at constant density resurfaced some years later in the inflationary model. Theories involving multiverses (Rees 2000), an infinity of universes, each with a different set of universal constants, became fashionable in the last decades of the 20th century. According to most of these theories, our universe is completely disconnected from all other hypothetic universes and there is no possibility of exchanging information with them. Anyway, we are primarily interested in our own universe, characterized by the fixed set of universal constants that have been painstakingly determined with ever increasing precision by actual physical observations. Theoretical cosmologists point out sometimes that it is difficult to chose between an infinite universe and an enormously large one. This may be true in the abstract, but it must be noted that an actually infinite universe leads to problems with equation (1). If M is actually infinite, the second and the third terms (involving a finite k and a finite L) become totally irrelevant. It is true that k£0 in equation (1) implies that the geometry of the universe is potentially infinite, but to make it actually infinite, one has to add an additional postulate, namely the so-called cosmological principle, which asserts that the universe is indefinitely homogeneous and isotropic at sufficiently large scales. However, Olbers gravitational paradox (Jaki 2000) cannot be explained away convincingly except for a universe with a finite mass. Therefore a flexible position with respect to the extrapolation of the known universe beyond our horizon is at least epistemologically reasonable, especially when that extrapolation leads to infinity. In fact, Einstein, Friedman, Lemaitre, Eddington and others (Einstein 1952) always assumed a finite mass for the universe, for both the open, flat and closed cases. Astronomers estimate that the visible universe contains about 1011 galaxies, each with about 1011 stars with an average mass of the order of the Sun’s mass (1030 kg), which results in a total mass kg, enormous but finite. On the other hand, it was perfectly reasonable, as Friedmann and Lemaitre did, to take k < 0, in which case the third term (with L > 0) would be unnecessary. In fact, during the expansion, especially in the early phase, when the cosmic background radiation density was very high, the radiation pressure would have overcome by far the gravitational attraction. In other words, a negative k would have an obvious counter gravitational physical meaning, not suspected by Einstein at the time of writing down equation (1). Since 1998, when the unexpectedly accelerated expansion of the universe was first reported, it has become customary to describe the universe using the Lambda Cold Dark Matter (LCDM) model, which assumes k=0 L>0 in Einstein equation (1). 1. They postulate the LCDM model, i.e. a flat universe (k=0, L> 0) with six free parameters, each of which with a given starting range: wb [0.005, 0.1], wc [0.001, 0.99], qMC [0.005, 0.1], t [0.01, 0.8], ns [0.9, 1.1] and As [1.49E-9, 5.46E-9] (see Table 1 in Ade et al, 2013). The range for the starting values of four of these parameters is quite ample, as it encompasses more than one and up to three orders of magnitude. 2. They adjust the values of those six parameters so that their model fits the experimental data. Obviously they start adjusting the values of the two parameters with the smallest allowed range amplitude (the last two) and then tune the other four. With such a number of free handles, the fact that they could find a proper fitting is not so surprising. Table 2 in their paper show the values they have obtained for the six free parameters. 3. They next use those adjusted parameter values to compute the values of other cosmological parameters in the LCDM model, such as H0, t0, and Wm. Table 2 and 5 in their paper shows three different sets of values, obtained by using the Planck satellite experimental results alone, or combined with other results (lensing data, WMAP low-l polarization, high resolution CMB data and baryon acoustic oscillation surveys). Depending on the data combination used, the best fits and the 68% adjustment intervals obtained are somewhat different. For the three variables mentioned above, the union and the intersection of the 68% intervals found are respectively: H0 [66.0, 69.4] [67.03, 68.5] km/seg/Mpc; t0 [13.738, 13.871] [13.769, 13.835] Gyrs; and Wm [0.288, 0.334] [0.298, 0.318]. The best fits used vary with the source, but those frequently given are: H0 = 67.15, t0 = 13.798 Gigayears, and Wm = 0.319. Observe that, since the estimated relative density of baryonic (non-dark) matter is 0.049, the relative density of dark matter is automatically computed as Wdm = Wm-0.049 = 0.268, while the relative density of dark energy is also automatically computed as WL = 1- Wm = 0.683, to assure that the universe is flat (k=0), the starting point of the whole computation. 4. In section 6 of the paper, the curvature of the universe, as deduced from their results, is said to be very small, of the order of Wk = 0.001, and this is given as a proof that the paper has validated the LCDM model. a) By using the model to make predictions of possible results, different from those used to adjust the model and confirming those predictions with new experimental results. In principle, measurements of Wm(z) in successive intervals (z, z+dz), are possible. b) By comparing the model with other available models and coming to the conclusion that this model fits better the available data. In this case, the best-fitted model is accepted provisionally as the good one, until new experimental data make a proper validation possible. In the following section we shall offer a comparison of several models (LCDM, KOFL, and a family of mixed models) and will try to signal the current strengths and deficiencies of the first two. To compare different cosmological models, we have started from reasonable values for the two cosmological parameters H0 and t0, and used equation (1) to find comparable results. Of course, we are discarding an infinite M, which would make the equation useless, and adjust its finite value and that of R0 to obtain the desired values for H0 and t0. As the sphere occupied by the cosmic microwave background radiation separates the visible (transparent) universe from the opaque (plasma) universe, not all of the mass (matter and radiation) in the universe is directly observable. Comparison of three different cosmological models: a flat (ΛCDM) universe (top-left) with k=0, an open (KOFL) universe (top-right) with Λ=0 and a mixed universe (bottom) with Λ= Λ0/2, k=-0.5. In all three, R1/2=R[Wm=1/2]. ΛCDM, H0=67.15, t0=13.798, Λ=1.0764.10-52 m-2, M=2.9595.1052 kg, T0=2.72548 K.
KOFL, k=-1, H0=66.55, t0=13.75, M=4.9527.1051 kg, T0=2.72548 K.
Mixed, H0=67.15, t0=13.798, Λ=0.5382.10-52 m-2, k=-0.5, M=1.9114.1052 kg, T0=2.72548 K.
The values we have used for H0 and t0 with the LCDM and the mixed model are those obtained as best-fit in the (Ade et al, 2013) paper. Therefore, as was expected, the value obtained for Wm0 is also the same, which confirms that our procedure is correct. For the Open Friedman–Lemaitre (KOFL) model, however, we have used slightly different values for H0 and t0, keeping them in both cases in the 68% interval postulated by (Ade et al, 2013). Notice that, once the two free parameters (M and R0) have been adjusted to the desired values of H0 and t0, the value of Λ with the LCDM model is automatically derived from equation (1). Notice also that the value adjusted for M is of the same order of magnitude as the estimation for baryonic mass in section 1, and that R1/2 and RSch are the same for the KOFL model and different for the LCDM and the mixed model. The difference between the three models is obvious: in the KOFL model, Wm0 = 0.0491, which means that all the mass in the universe is baryonic, so, properly speaking, there is neither dark matter nor dark energy (Λ=0 in this model). In fact, the exact value of barionic matter could be increased and a certain amount of non-luminous dark matter could be introduced, simply by adjusting slightly the values of the two parameters, H0 and t0. In the LCDM model, however, Wm0 = 0.319, which (assuming that Wb = 0.0491) corresponds to a dark matter relative density equal to 0.268, as stated in the Planck paper. The remainder up to 1, WL = 1- Wm = 0.683, would correspond to dark energy, a potential energy associated with L>0. In the mixed model, things are intermediate: there is about one half the amount of dark matter (0.1248) and dark energy (WL = 0.3415). but in these cases the universe would be either flat or open. Further results for these and other cosmological models, including KOFL models for different values of k and another mixed case, where k=-0.25 and Λ= Λ0/4, can be found in (Gonzalo & Alfonseca 2013). On the basis of a timescale comparison alone, it is not possible to discriminate between [the two] models. We intend to update that comparison with the current estimations of H0 and t0. Equation (3) is compatible with the observational evidence for the current value H0t0 = 0.9358 with this model, while the current relative density computed at equation (4) is Wm0 = Wm(y0) = 0.0491 = Wb. which results in = 5.59, close to the expected relation in our neighbourhood (Weinberg 2008). In this model, the dark matter effect on gravitational lensing could perhaps be explained, at least in part, because the average density of matter was much more dense at early times than it is at present. What our telescopes are seeing now is a superposition of snapshots of the universe since . In the LCDM model (k = 0, L > 0), the density of the universe W=Wr+Wm+WL relative to the critical density is assumed by hypothesis to be exactly equal to 1. The space-time curvature of the universe is assumed a priori to be flat, and therefore, there must be a lot of dark matter and a lot of dark energy to make (Wm + WL) exactly equal to one (Wr being now negligible), where Wm = Wb + Wdm. Curiously enough, equation (8) has the same shape as equation (4) for the KOFL model, although the meaning of the parameter y is different in both cases. which results in , much higher than the expected ratio of 6 (Weinberg 2008). This is something that requires a satisfactory explanation. 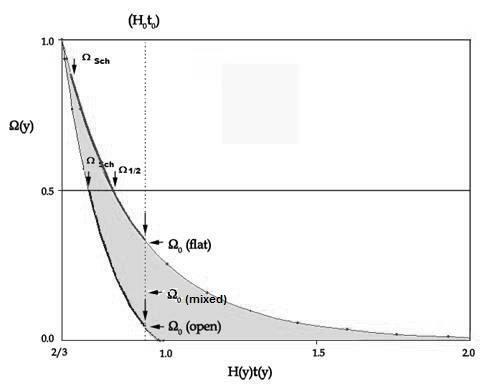 Figure 1a, which corresponds to Figure 9 in (Freedman et al 2001), with the horizontal axis modified to unify both models (KOFL and LCDM), shows clearly that both are compatible with the current estimations of H0 and t0. This is the same conclusion specified by (Freedman et al 2001). The same applies to a whole family of mixed cases, represented by the part of the horizontal dotted and dashed lines located between the vertical dotted and dashed lines. Figure 1b compares the evolution of Wm(y) with H(y)t(y): equation (4) vs equation (3) for the open universe (bottom curve), with 2/3<H(y)t(y)<1; equation (8) vs equation (7) for the flat universe (top curve), with 2/3<H(y)t(y)<¥. The current situation (H0t0) is represented in both models by the same abscissa (the dotted line), as the two values are almost indistinguishable at that scale. A horizontal line and separate arrows mark the half-density situation Ωm(y)=1/2. The section tinted in light grey corresponds to the range of different solutions for the mixed cases (k<0 and L>0). The stronger parts of the two curves correspond to the density values we have averaged in the previous computation (between the time when the universe stopped behaving as an exploding black hole and the present situation). Notice that although both parts of Figure 1 seem to represent the same curves (exchanging the axes), the vertical axis of Figure 1a is not H(y)t(y) (as in the horizontal axis in Figure 1b), but H0t0 (different estimations for the current value of the product). One interesting difference between the models is the time when the universe would have reached its Schwarzchild radius, i.e. it stopped behaving like an exploding black hole. As indicated in Table 1, with the KOFL model this would have happened 414 million years after the Big Bang, at a redshift z=18.38, which means that the light of every object we have been able to detect was emitted by that object long after the universe could no longer be considered as a black hole. With the LCDM model, however, things are quite different, as the universe would have reached its Schwartzchild radius much later, over 3 billion years after the Big Bang, at a redshift z=2.134, which means that the light of some of the objects we have detected comes technically from within a black hole (see figure 2). This bizarre situation is difficult to explain. Another point of comparison between different models uses the situation at the time of Last Scattering (LS), about when the cosmic background microwave radiation was generated. As it is well known, the minute anisotropies in the CMB can be studied by means of spherical harmonics of order l = 0, 1, 2..., where the multipole moment l, detected by analyzing anisotropies at an angular separation qº, can be approximated by: l » 180º/qº. Theory states that l < 100 represents anisotropies between points which at the time of last scattering were separated further than the horizon at that time (the distance where the expansion of the universe would have reached the speed of light), while l > 100 represents anisotropies between points inside the horizon. 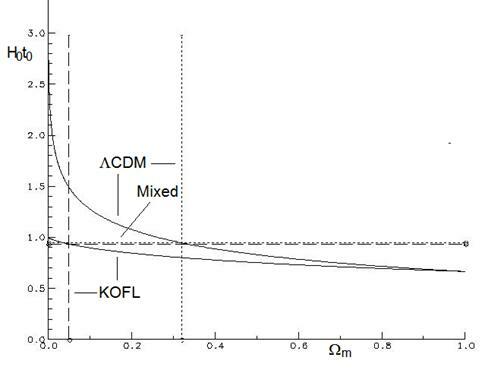 The multipole corresponding to maximum anisotropy would take place, for different models, at about 200 for the LCDM model and at a higher value for the KOFL model (due to the high curvature assumed by this model (K=-1). Table II compares the results for both models. Experimental measurements by the Planck satellite result in l max » 200. It can be seen that the LCDM model fits better this result. The KOFL model, however, explains better the observations of high red-shift galaxies. The LCDM model can be adjusted in such a way that the multipole anisotropies for l > 100 are predicted correctly, although the value obtained for H0 (about 67) happens to be smaller than the value computed directly from Cepheid and supernovae observations in galaxies (about 73). This discrepancy should be explained (Friedman et al 2001, Siegfried 2014). On the other hand, the LCDM model is unable to explain the behavior of the multipole anisotropies for l < 100. A mixed model with k<0 and Λ>0 has been offered as an alternative explanation (Aurich et al, 2004). which mimics an accelerated expansion (a lower value in recession velocity at higher distances) completely unrelated to any non vanishing cosmological constant. Notice that we are neglecting the dipole component of our galaxy moving with respect to the CMBR at a speed of the order of c/1000. When S. Perlmutter reported (Schwarzschild 2011) the accelerated expansion of distant type Ia supernovae, he pointed out that the apparent magnitudes reported might need corrections due to a possible dimming by interfering dust at early cosmic times. Let us make a quantitative evaluation of the corrections to the measured magnitudes due to dimming by cosmic dust. These corrections must be expected to bring down the observed magnitudes for high redshift type Ia supernovae, and to become negligible for supernovae closer to us, affected by much less cosmic dust ( ). Therefore they must become increasingly important for increasingly more distant supernovae (SN)(tgf <t << t0, with tgf = galaxy formation time) beyond which no supernovae can be observed. which becomes for small redshifts, for z = 1 and for z up to zobs= (the currently maximum observed redshift). The corrections are substantial even at moderate redshifts of the order of but the important point is that they may still be compatible with a small upwards curvature in the logarithmic magnitude versus velocity plots, therefore suggesting an accelerated expansion. This accelerated expansion would not have anything to do with a non- vanishing cosmological constant. The LCDM model has been considered standard in most publications on cosmology since 1998. However, the fitting of the Planck satellite experimental results to that model by (Ade et al 2013) cannot be considered a full validation, since there are still important discrepancies to be explained. It is interesting to notice that, when a detailed comparison was done in 2001 by Freedman and colleagues (Freedman et al 2001), their conclusion was: experimental data, at that time, were compatible with both the LCDM and KOFL models, as well as with a whole family of intermediate (mixed) models. In this paper we have compared three different models, LCDM, KOFL for k=-1, and a mixed model, taking into account the values of H0 and t0 recently deduced from the data provided by Planck’s satellite. The first model implies the existence of large quantities of dark matter and dark energy, the second can be easily adjusted to predict none of them, the third occupies an intermediate position. 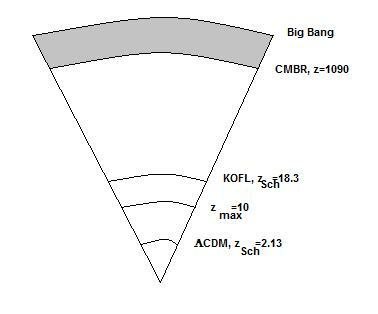 The KOFL model seems to have an important problem to solve: the behavior of the CMB anisotropies for multipoles l > 100, especially the fact that it predicts a relatively high value for lmax. The LCDM model appears to be correct there, but still has several important problems to solve: a) a discrepancy between the inferred value of H0 and the higher value obtained through astronomical observations; b) the behavior of the CMB anisotropies for multipoles l < 100; c) the large quantities of dark matter and dark energy predicted, which nobody knows what they are and d) the fact that the light from the farthest objects currently detected (z»11) must have been emitted when the universe was technically still an exploding black hole. As to the current acceleration of the universe, as pointed out in section 3.3, it could also be fitted (at least in part) within a KOFL or a mixed model. A more accurate determination of H0 is clearly needed. Hopefully, NASA´s James Webb Space Telescope, to be launched in October 2018, will make it possible to compute it with an unprecedented precision, less than 1% (private communication by John C. Mather, Principal Investigator). Another point to be considered is the fact that the temperature of the universe at the time of last scattering is usually approximated to exactly 3000 K. Perhaps it should be noted that a slight change in this temperature (100 K up or down) moved the time when the CMBR happened by about 25,000 years in each direction. The search for dark matter in WIMPS, axions and more exotic candidates has been going on for over three decades now. In spite of considerable experimental and theoretical efforts, it has been unsuccessful. Baryonic matter in early galaxies, whose light was emitted at times when the cosmic density was much higher than it is now, could account for at least some of the assumed effects of the elusive dark matter. On the other hand, at least a part of the cosmic acceleration currently attributed to dark energy could also be explained as a result of purely relativistic effects. Therefore, we should not assume that LCDM is the only alternative. Different models (such as the KOFL model or even mixed models) should be investigated and compared in depth, taking into account if their predictions of the maximum observable redshift from very distant early galaxies are compatible with astrophysical data. Acknowledgements: We are very grateful to Professors Anthony Leggett and Francisco José Soler Gil, as well as to Martín López Corredoira of the Astrophysical Institute in the Canary Islands, for reading carefully and critically our manuscript and for their encouragement to send it to a good journal in the field of Astrophysical Cosmology. In this Appendix we show that the KOFL model requires a reasonable time for the first proto galaxies to be formed, so that the maximum observable red shifts may be expected to be substantially lower than z_Sch, the red shift corresponding to the universe´s Schwarzschild radius. If we start from the KOFL model and assume that protogalaxies started forming by an aggregation of cosmic dust around a cosmic irregularity after the universe reached its Schwartzchild radius (when it stopped behaving like a black hole), their construction should have ended before the time of the maximum observed redshift (which currently is about 10), when galaxies can be observed now. Let us estimate the protogalaxy formation time for a galaxy with mass Mg, so as to evaluate the order of magnitude of the maximum observable redshift. Variable r will represent the size of the galaxy during its formation, starting at zero (when the galaxy was just a cosmic irregularity) and ending at Rg when the galaxy was fully formed. where according to Peebles (quoted in Weinberg 2008, p. 424) the factor is of the order of 2.7.
quite close to the value 2.7 estimated by Peebles. Ade, P.A.R. et al (261 authors) 2013, Planck 2013 results. XVI. Cosmological parameters, arXiv:1303.5076. APS News 2013, 22, 6, p. 1. Aurich, R., Lustig, S., Steiner, F., Then, H., Hyperbolic Universes with a Horned Topology and the CMB Anisotropy, Class.Quant.Grav. 21 (2004) 4901-4926. arXiv:0403597. Einstein, Albert 1952, The Principle of Relativity (Toronto: Dover). Freedman, Wendy L. et al (15 authors) 2001, Final Results from the Hubble Space Telescope to Measure the Hubble Constant. The Astrophysical Journal, 553:47-72. Gonzalo, Julio A. 2012, Cosmic Paradoxes, chap. 6 (Singapore: World Scientific). Gonzalo, Julio A. & Alfonseca, Manuel 2013, arXiv:1306.0238. Jaki, Stanley L. 2000, The Paradox of Olbers Paradox (Pickney, MI: Real View Books). Livio, M. & Riess, A.G. 2013, Measuring the Hubble constant, Physics Today 66, 10, 41. Rees, Martin 2000, Just Six Numbers (New York: Basic Books). Schwarzschild, B. M. 2011, Physics Today 64, 12, 14. Siegfried, T. 2014, Cosmic Question Mark, Science News 185:7, 18-21, April 5, 2014. 14. Weinberg, S. 2008, Cosmology (Oxford: Oxford University Press).